In this study we will examine the value of meeting together with other believers, focusing a little on the idea of churchgoing from the perspective of a churchgoer. 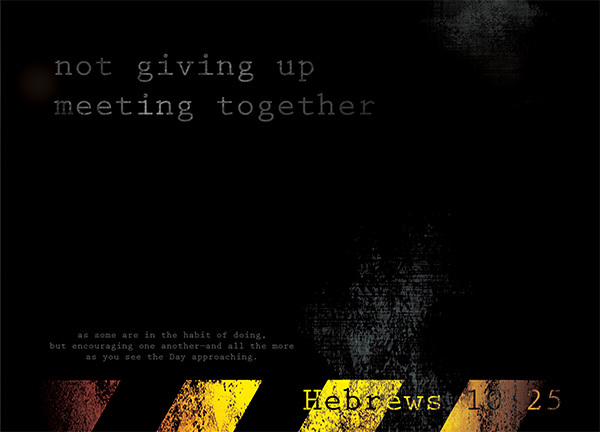 not giving up meeting together – I was curious as to the term employed in this phrase. Not giving up meeting together? That sounds very different from do not stop meeting together, or do meet together. A look across other versions shows that the terms used are typically translated as – not neglecting to meet together, not forsaking our own assemblies. This strongly hints that even in the early days of the Church, meeting together, assembling together, fellowshipping together was something that was easy to give up. The thought of abandoning and forsaking meeting together was common. The temptation to neglect to meet together was rife. That was the case 2000 years ago in the early church days. That is still the case today. People are, whether tempted or forced or disillusioned or exhausted, giving up on meeting together in fellowship and in worship. Why would that be the case? There is no perfect church. I was once told that if I ever find the perfect church, don’t go in, because once I go in, it would be imperfect. Persecution was common in the early church days, perhaps more common than it is for us today – at least for most of us today. Persecution still exists today, though in many many other different forms than in the old days. With the evolution of society and of civilisation, temptations have also evolved – we likely have a lot more temptations today than the people in the past. People have also become more and more sophisticated – or in other words, complicated – and church is a hive of complicated people trying very hard to accomodate each other and to embrace each other (despite our individual flaws) in godly love – and that is not easy. Serving an arrogant brother in Christ can be exasperating. Working with an unreasonable sister-in-Christ can be irritating. Having to constantly minister a group of youths and listen to them share their troubles and not work on their mistakes time and time again and be draining. Seeing your spiritual mentor or your pastor waver and fall in their faith can be stumbling. Having to put up a mask and pretend you’re happy pretend you’re smiley pretend you are holy can be suffocating as well. Yet the opposite is true. When you see somebody serving fervently and zealously, that passion is contagious. When you see somebody consistently pursuing more knowledge about the word of God, you can be inspired and encouraged to do so as well. as some are in the habit of doing – I go to church. I believe I’ve been going weekly since I was in my mother’s womb. I can count the number of Sundays I’ve missed church on a single hand, usually because of some massive illness – and ever since I was out of Sunday School, if I happen to miss church on a particular Sunday, I’ll make up for it by going for another service on a weekday, and I’ll listen to the sermon recording that I missed. Even when I’m overseas, I will just walk into a church and attend their service. Admittedly, that’s a habit. Churchgoing is a habit. I can’t deny that at some points in my life, churchgoing was meaningless and simply ritualistic and performed out of habit. Not now though, thankfully. Hence, as a churchgoer, while I know of the reasons of some non-churchgoers, I must say that I won’t be able to give a very rounded argument from their point of view since I’ve always been a habitual churchgoer. But just like going to church can be a habit, not going to church can also be a habit. Especially with the advent of technology, and there are online churches, online sermons and online fellowships. I personally love the idea of an online church – a church without walls. I love online ministries and I believe in them – I believe in the power and influence of the internet, that’s something I study – although the influence of the internet is admittedly more often than not used maliciously today. I’m not a very sociable person – and sometimes I do wish I can just stay at home on Sundays and study my Bible the whole day. But perhaps precisely because I’m not a very sociable person, fellowship is like a beacon of light for me to save me from sinking into random darkness. Must a Christian go to church? In no parts of the Bible did any apostle claim that you are not a Christian if you don’t go to church. In no parts of the Bible did any apostle say that you will not be saved if you don’t go to church. Instead, what they did say is that salvation is not by our own works, but by the grace of God through faith in our Lord Jesus Christ. They did harp a little on the importance of fellowship, on serving your brothers-and-sisters, of supporting them with godly love and concern. This is a topic I don’t want to go deep into. I go to church. I support online churches, though, but that’s on top of going to church. I do not face persecution for going to church, and I’m not hindered physically to go to church. I know I am blessed. I appreciate it. encouraging one another – Of course, this verse isn’t merely speaking about going to church, even though I intentionally focused on that. There are many other ways to meet together with our brothers-and-sisters in Christ in fellowship and in worship. Small-group gatherings, or whether you call it, where a small group of believers gather together, maybe at someone’s house, and hold a short session of worship or fellowship – these can form the core support system for believers. I like small groups, I attend as many of these as I possibly can – on top of going to church. Sometimes all it takes to help somebody is a single message of encouragement. But that requires somebody to send it to you, no? There is great value in having somebody else with us to keep us on track. You know, I personally think that this verse isn’t really about the act of going to church. I know I know, kind of lame to say this now after spending an entire post focusing on the act of going to church. Have you ever gone to church on a Sunday and yet feel like you’ve not met together with anybody, you’ve not fellowshipped together with anybody, you’ve not connected with anybody even though you were standing in the midst of a congregation? Going to church gives you a platform to meet with other brothers-and-sisters, but you can choose not to ignore people. You can choose to wall yourself up. You can choose to live on a one-man island even when you’re in a crowd of believers. I’ve personally experienced that before – that’s the period of time when I felt that going to church was meaningless and nothing more than a ritualistic act out of habit. I’m quite a disciplined person, and hence I still went to church religiously in that time. Yet, it’s also because of the fact that I persisted in going to church that my walls were eventually broken in church and I was somehow saved out of the pit that I hid myself in. If you don’t go to church out of your own volition, I encourage you to. If you already go to church, I encourage you to consider also visiting online churches (on top of going to church, of course). They don’t need to be mutually exclusive. If you seriously cannot find a suitable church to go to, then start one. As long as you’re not fellowshipping alone. Not that God isn’t with you when you are worshipping him alone, but there is power and value in numbers. For where two or three are gathered together in my name, there am I in the midst of them [Matthew 18:20]. Great message. God bless you! Thanks for writing about this verse and clearing up some things that many Christians get wrong.